Drivers looking for a practical, compact vehicle that can easily manage the narrow city streets of Pensacola can find what they’re looking for from the new 2019 Toyota Yaris compact sedan, which is now available here at Bob Tyler Toyota! Under the hood of the 2019 Toyota Yaris is its 1.5-liter 4-cylinder power source, which is able to produce up to 160 horsepower and 103 lb-ft of torque for a quick and fun driving experience. Drivers that opt for the XLE model also benefit from Normal and Sport driving modes. With its fuel-efficient engine, the new 2019 Toyota Yaris is able to achieve up to 30 city / 39 highway / 34 combined MPG with its L and LE trim levels, and 32 city / 40 highway / 35 combined with its XLE trim level for easy efficiency that lets you avoid the gas station longer! The 2019 Yaris features a streamlined silhouette, a sporty new front grille with a race-inspired honeycomb design, a unique shark-fin antenna, and available integrated fog lights. Some of the sporty accents available with it include chrome-tipped exhaust and a rear lip spoiler. 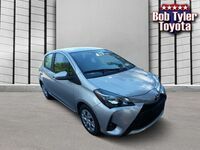 Get the 2019 Toyota Yaris at Bob Tyler Toyota! Those interested in getting behind the wheel of one of our available Yaris models are encouraged to get in touch with sales staff here at Bob Tyler Toyota! You can do so by giving us a call or contacting us online using the contact form on this page. From there, we’ll be happy to set you up with a test drive in one of our available vehicles. We look forward to hearing from you!